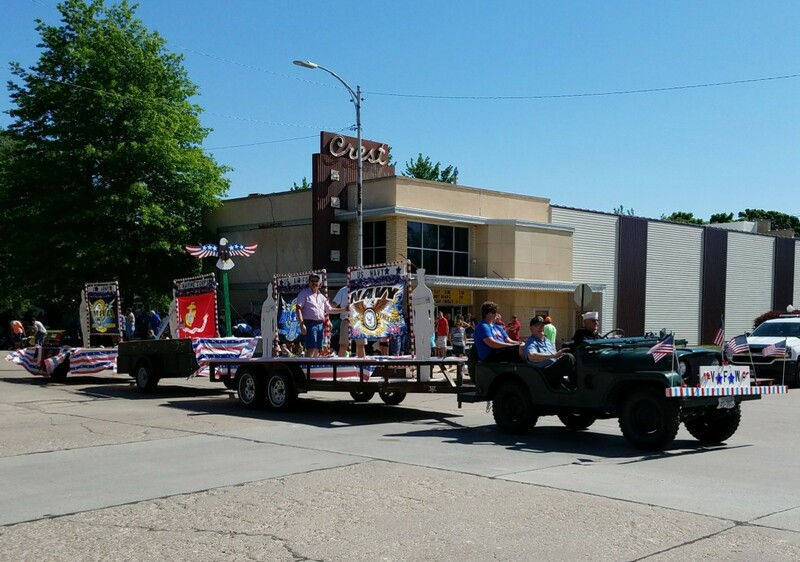 Summer Update: Happy 4th of July! 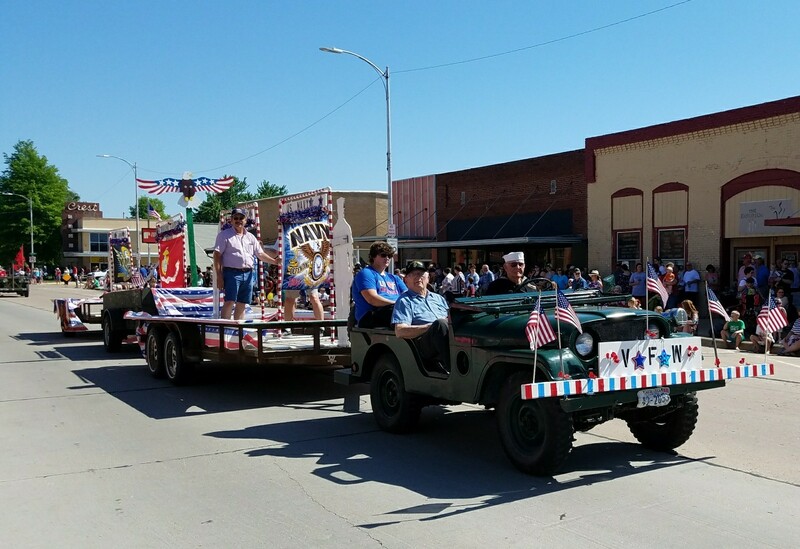 Summer is a time for outdoor activities and festivities happening across the State. Special community gatherings at fairs, parades, fireworks, barbeques, concerts, baseball games and family gatherings all kicking off a summer filled with excitement and celebration. This is especially true during this week of the Fourth of July. This year we celebrate our Nations 242nd anniversary of the signing of the Declaration of Independence. It is a time to step back and be thankful for the rights, liberties and freedoms that we share. Remembering those who have so bravely fought for and defended these freedoms. Those that broke the sod, pioneered a new way of life, struggled and persevered to make a better life for us all. We cannot take for granted what they have provided for us and in their spirit we must work together to build a better life. It is my hope that you and your family have a safe and enjoyable Fourth of July. 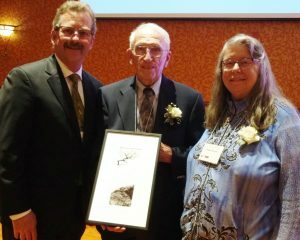 I would like to share a few examples highlighting the vitality of our communities: Bone Creek Museum in David City received the Governors Art Award and they will be celebrating their 10th anniversary on July 8th and Henningsen Foods announced an expansion to their operations; a new business G & G Storage opened in Mead; Men in Mission continue their work in Ashland and Obadiah Pruitt received his Eagle Scout Award; Shell Creek watershed was delisted from the EPA’s atrazine impairment on aquatic life (a first in the Nation) and the Shell Creek Watershed Improvement Group was key to making this happen, Schuyler High School students are conducting water sampling in this watershed; Wahoo High School Performing Arts Program was recently recognized at the Nebraska High School Theatre Awards winning Outstanding Musical Theatre Production, Outstanding Ensemble and Outstanding Performance in a Lead Role for “Shrek the Musical,” Wahoo State Bank is making great strides in its rebuilding; the Saunders County Livestock Association, Soybean and Corn Growers remain and strong and vital part of the district. It is in these ways we as individuals can come together to grow and enhance our communities, our state and our country. As we celebrate our Independence Day we must remember that it is contributions such as these from individuals from all different backgrounds and ethnicity that has grown and formed our nation into what it is today. With recent federal events highlighting policies on immigration and border security we must keep in mind where our nation has been and where we would like to see it go in the future as we continue to grow this state and country. These are issues that our federal administrations have been tasked with facing for many years and those decisions and policies impact us all. Concerns about human trafficking and safety are real issues and important considerations that require extensive thought and policy debate. However, family separation in this manner is never a good answer to solving them. Having a secure and welcoming border is in the best interest of everyone. 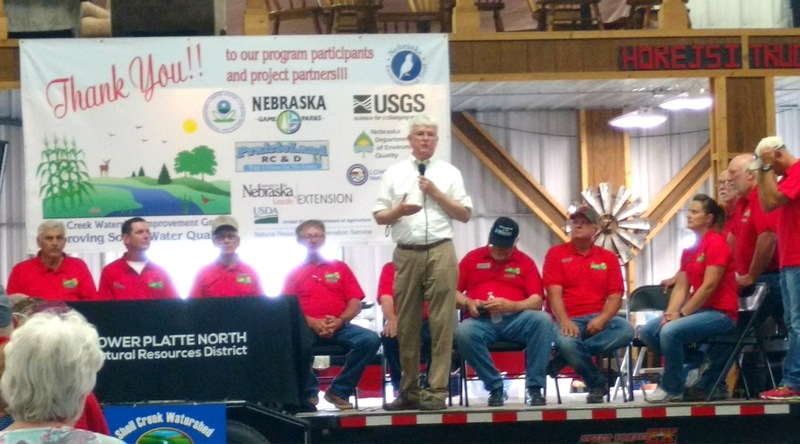 The last few weeks I’ve had the opportunity to look at several water projects in eastern and southeastern Nebraska. In particular, I attended the US Army Corps of Engineers annual Open House at the former ordinance plant near Mead, NE. While at the main ground water treatment plant I had the opportunity to meet and discuss the Corps work with Janet Mathews-Flynn, Project Manager. Our discussions included characteristic of the plumes, well locations, treatment plants and procedures. In addition, we discussed future activities, land use and remediation in general regarding the Corps remediation program. 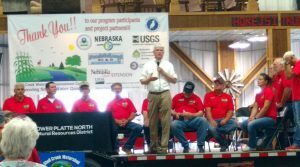 More recently I attended the 2018 NRD basin tour that included the Lower Platte South and Nemaha basins. The two day tour provided an opportunity to see and hear about water quality and quantity management issues and conservation projects. In the Lower Platte South Basin we toured areas such as the Antelope Valley Corridor Flood Control, Saline Wetlands Conservation, Hanes Branch Corridor/Spring Creek Prairie, Ash Hollow Dam and the Lincoln Well Field. Our second day was spent in Nemaha Basin touring varying sites that included Duck Creek Recreation Area, Auburn Municipal Water (a high tech water treatment facility), Shubert Wellhead Protection, Tecumseh Niobium Mine proposal and on farm conservation practices. We also looked at the little Nemaha River channelization project completed years ago and the bank erosion that is being caused both because of the channelization and the lack of flood control in the upper regions of this river. Finally it was a privilege to attend the EPA’s delisting of the Shell Creek Watershed for atrazine impairment of aquatic life announced by Secretary Pruitt just north of Schuyler. 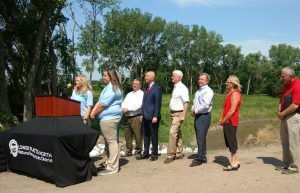 This is a first of its kind using an integrated water management plan that included 340 conservation management methods over 12 years that included 110 miles of Shell Creek. This was accomplished through a collaborative of agencies and individuals that began 19 years ago with the forming of the Shell Creek Watershed Improvement Group (SCWIG). 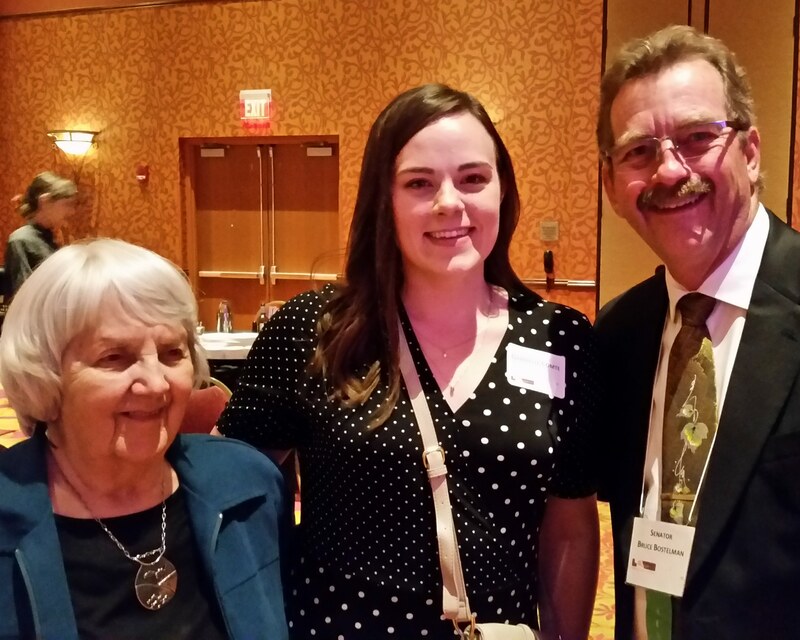 This locally led group of landowners worked diligently to make this a reality. In addition, Newman Grove High School students have completed water sampling of up to 70 sites in the watershed for the past 16 years. 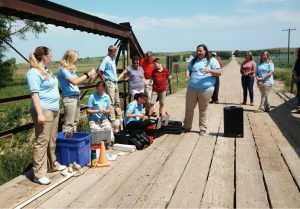 Schuyler High School students have also worked over the past 3 years with the water sampling project as well. After the ceremony Newman Grove students provided attendees with water sampling demonstrations. 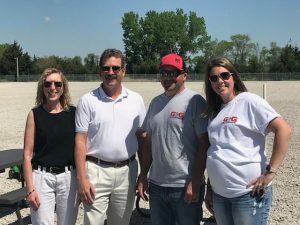 Congratulations to everyone involved this was a great opportunity to showcase how working together made a significant impact to our environment. 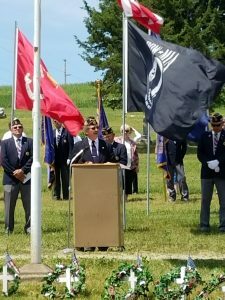 This Memorial Day I participated in Memorial Services with Valley of Paradise Post 371 Valparaiso at Touhy, Raymond, Agnew and Valparaiso. 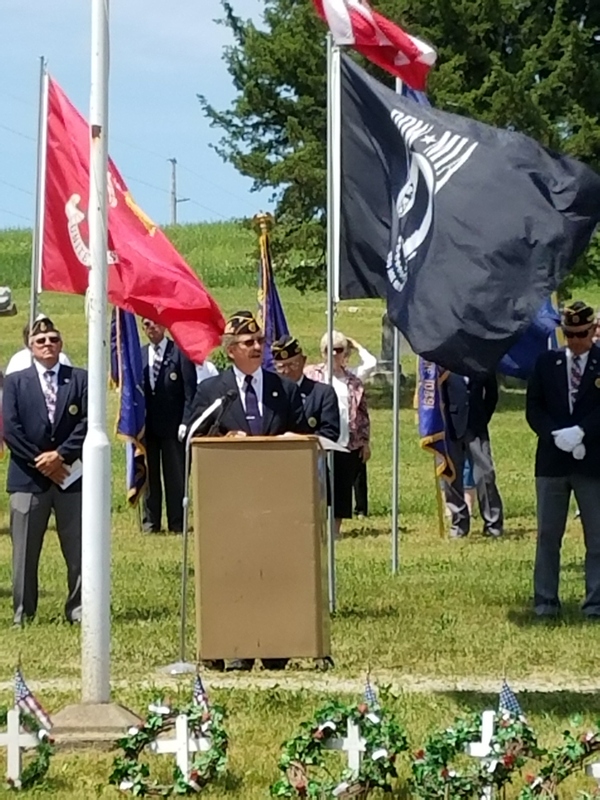 The pictures below are of the Memorial Day address at the Valparaiso Cemetery. I want to again thank and honor all those who have served and sacrificed for our Country. A memorial at Pearl Harbor references a poem that first lady Eleanor Roosevelt kept in her wallet during WWII. 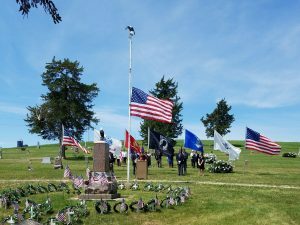 This Memorial weekend take time to pause, stand still, and remember the men and women that have given the ultimate sacrifice for country, family, friends and for those that stood beside them. Remember the Gold Star Families, the loved ones left behind that hear their voices and see their faces in their memories. A father or mother, brother or sister, son or daughter, that gave of themselves in time of war and peace. A time to reflect and time to honor those that gave their all. 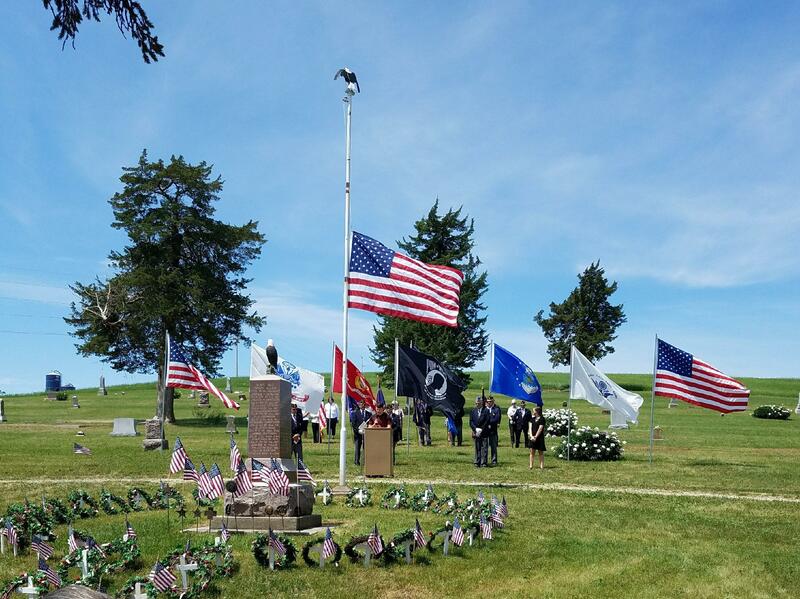 Join me this Memorial Day by attending a memorial service in your town, or wherever you may be to remember, reflect and honor those that gave their all. Have a safe summer and Memorial Day Weekend. 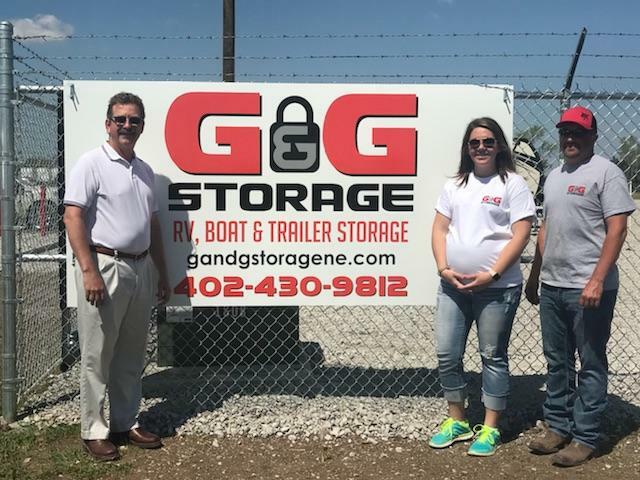 On Wednesday, May 16th I attended the ribbon cutting ceremony to mark the official opening of G and G Storage in Mead, owned by Josh and Cortney Girmus. 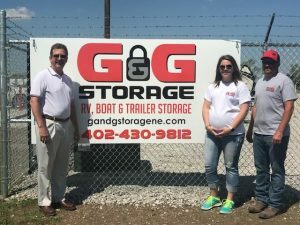 G and G Storage can store RV and trailers and will hold up to 280 units. 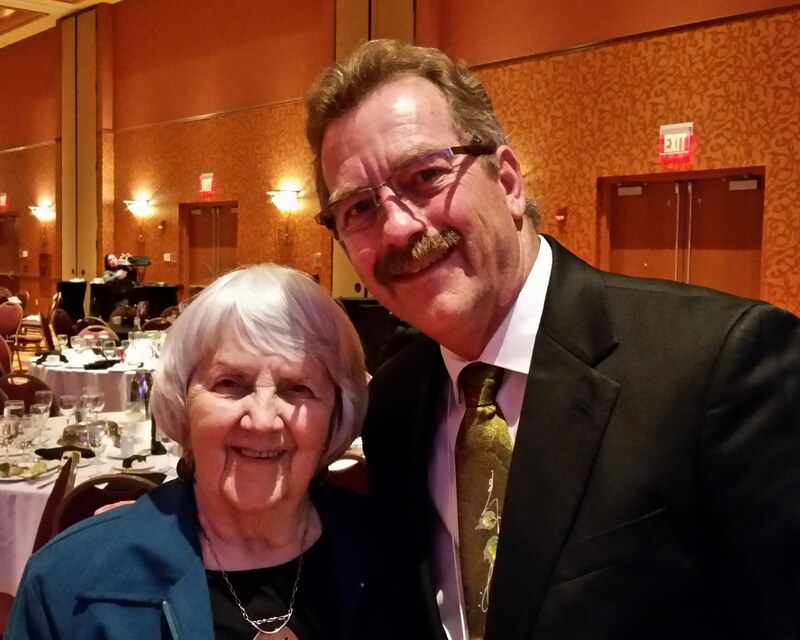 It’s great to see these business’s operating in and serving the communities of District 23. I wanted to share these opportunities to serve on Boards and Commissions Appointed by the Governor and encourage anyone interested to apply. The application form can be completed at: https://governor.nebraska.gov/ under “Constituent Services.” Serving on a board or commission is a great way to stay involved in our communities! I traveled to Chadron State College last week to attend a meeting as a member of the Building and Maintenance Committee. The purpose of the Building and Maintenance Committee is to exercise oversight of the deferred and preventive maintenance activities for state operated buildings across the state. The Committee met on Tuesday, May 1st to obtain updates on the 309 Task Force for Building Renewal Projects and Chadron State College funded projects and requests. The Committee members also recieved a tour of Chadron State College. You are currently browsing the District 23 News and Information blog archives for the year 2018.